Introduction: Human Vascular Cell Adhesion Molecule -1(VCAM1) is a 110 kDa transmembrane glycoprotein expressed in vascular endothelial cells (EC), neurons, fibroblast and macrophages. Expression is regulated by inflammatory cytokines such as IL-1, TNFalpha, IL-4 and IL-13. Soluble VCAM-1 (sVCAM-1) is made when the extracellular part of VCAM-1 is shed from the cell surface into the circulation. The ligands for both are the alpha-4integrins. Ligand binding to EC bound VCAM-1 promotes leukocyte recruitment and extravasation whereas binding to sVCAM-1 promotes neovascularization, critical to both wound repair and tumor growth. Increased serum levels of sVCAM-1 has been found in patients with breast, ovarian and gastric cancers, however, the impact of surgery on sVCAM levels has not been determined in the cancer setting. This study’s purpose was to evaluate plasma levels of sVCAM-1 during the first month after minimally invasive colorectal resections (MICR). Results: A total of 91 colorectal cancer (CRC) patients(pts) were studied (26% rectal, 74% colon). The MICR’s were laparoscopic-assisted in 60% and hand-assisted in 40%; the overall mean incision length was 7.4 ± 3.3 cm and mean length of stay was 6.0 ±; 2.2 days. The mean sVCAM-1 levels (ng /ml) were significantly higher on POD1 (903.5± 291.6 , p<0.001) and POD3 (976.9± 270.4, p<0.001) vs PO levels (808.9±233.0). Levels remained significantly elevated for the POD7-13 (959.8 ± 231.9; n=49, p< 0.001), POD14-20 (949.4± 309.8;n=30,p=0.004), POD 21-27 (816.4± 176.6;n=23,p=.001) and POD28+ (912.8± 261.2;n=53,p<0.001) time blocks. Discussion: For the vast majority of proteins 1-3 day plasma level changes are noted post MICR. 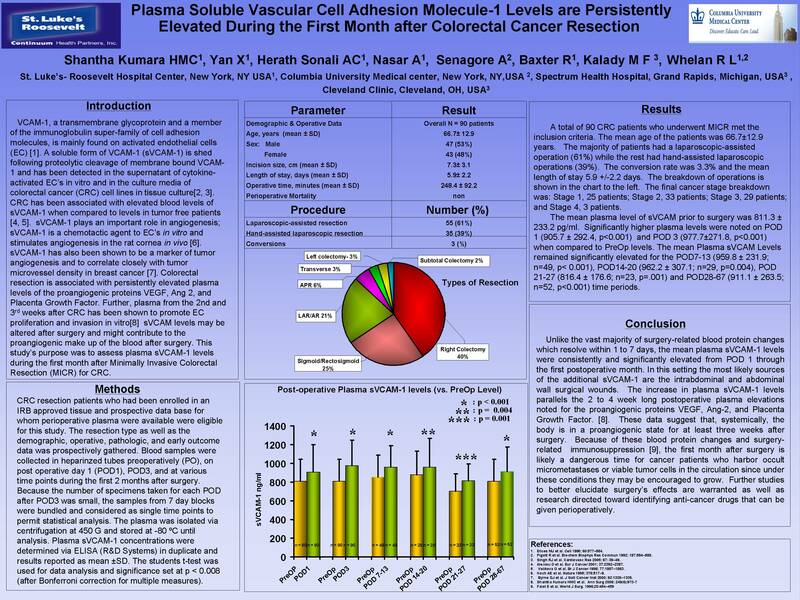 Plasma sVCAM-1 levels are elevated for over 1 month. Similarly persistent increases were noted for VEGF, Angiopetin2 and PLGF. The likely source of these proangiogenic proteins are the wounds. This environment may promote tumor growth post MICR inpts with residual cancer. Further study is needed to determine the duration and significance of this effect. Anti-cancer treatment perioperatively may be warranted.